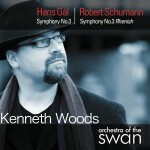 Hailed by Gramophone as a “symphonic conductor of stature,” conductor Kenneth Woods has worked with the National Symphony Orchestra (USA), Royal Philharmonic, Cincinnati Symphony, BBC National Orchestra of Wales, Budapest Festival Orchestra, Royal Northern Sinfonia and English Chamber Orchestra. He has also appeared on the stages of some of the world’s leading music festivals, such as Aspen, Scotia and Lucerne. In 2013, he took up a new position as Artistic Director and Principal Conductor of the English Symphony Orchestra, succeeding Vernon Handley. In 2015 he was made the second Artistic Director of the Colorado MahlerFest, the only American organization other than the New York Philharmonic to receive the Gold Medal of the International Gustav Mahler Society. Under Woods’ leadership since 2013 the English Symphony Orchestra has gained widespread recognition as one of the most innovative and influential orchestras in the UK. During this period the ESO received Classical Music Magazine’s “Premiere of the Year” plaudit for both Donald Fraser’s orchestration of the Elgar Piano Quintet in 2015 and John Joubert’s opera Jane Eyre in 2016. Jane Eyre also marked the ESO’s first foray in to opera, and the premiere and subsequent Somm Recordings CD were both received with international critical acclaim including a string of five-star reviews, Disc of the Month nods and Joubert’s opera was also named the Birmingham Post classical music highlight of 2016. 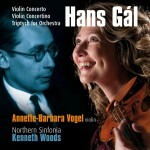 Woods has also helped make the ESO a major force in the recording industry after a ten-year hiatus between ESO discs. 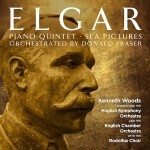 His first disc with the ESO was volume one in the Complete Piano Concertos of Ernst Krenek, selected by The Times of London as one of their “Best Recordings of 2016.” The ESO’s recording of Fraser’s acclaimed Elgar orchestrations on Avie was a Classic FM Disc of the Month, and more recently, Nimbus have released “An Eventful Morning in East London” with Harriet Mackenzie, a collection of 21st Century Violin Concertos welcomed with a five-star review in The Times of London. In 2016, Woods and the ESO launched their 21st Century Symphony Project, an ambitious multi-year effort to commission, premiere and record nine new symphonies by leading composers, with the triumphant premiere of Philip Sawyers’ Third Symphony. 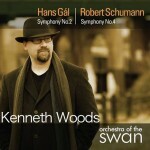 Kenneth Woods’ transformational work as an orchestra builder first came to international attention during his tenure as Principal Guest Conductor of the Stratford-upon-Avon based Orchestra of the Swan from 2010-4. His leadership there lifted the orchestra to a new level of world-wide critical acclaim and audience popularity and produced a significant string of recordings. 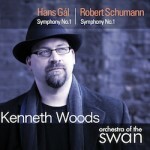 He and Swan recorded the first complete cycle of the symphonies of Austrian composer Hans Gál, paired with those of Robert Schumann for Avie Records. 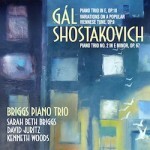 This series was among the most successful classical recording projects in recent years, highlighted in National Public Radio’s All Things Considered, Performance Today, BBC Radio 3, the Sunday New York Times, the Sunday Telegraph and Washington Post. 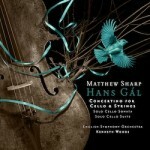 It also won the Diapason d’or in France and was an Editor’s Choice in Gramophone. 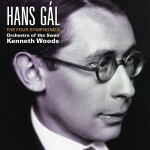 Among his other OOTS recordings are Schoenberg’s chamber ensemble versions of Das Lied von der Erde and Lieder eines fahrenden Gesellen (for Somm) by Gustav Mahler, which won the coveted IRR Outstanding rosette from International Record Review, and “Spring Sounds, Spring Sea” (for MSR), a MusicWeb ‘Record of the Year’. 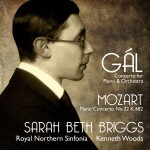 Other highlights include orchestral music of Philip Sawyers (another MusicWeb ‘Record of the Year’) for Nimbus, music of Brahms and Schoenberg for Somm, and a disc of contemporary trumpet concerti by John McCabe, Robert Saxton and Deborah Pritchard with trumpeter Simon Desbruslais for Signum. A widely read writer and frequent broadcaster, Woods’ blog, A View from the Podium, is one of the 25 most popular classical blogs in the world. 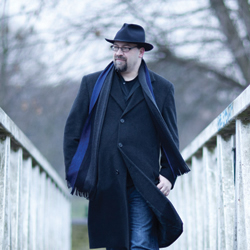 He has spoken on Mahler on NPR’s All Things Considered and is a regular speaker on BBC radio programmes. Since 2014, he has been Honorary Patron of the Hans Gál Society.